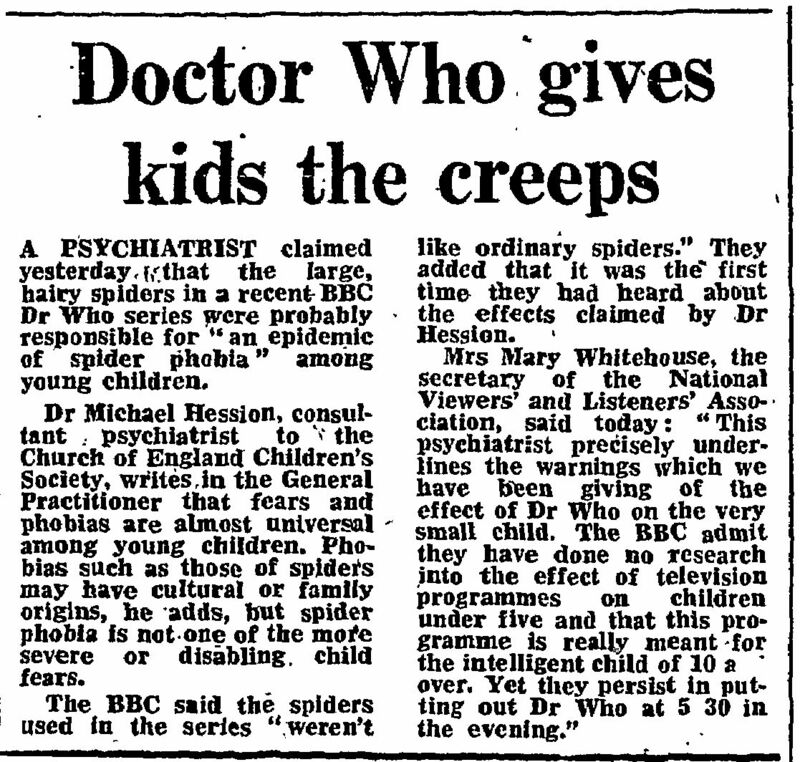 A PSYCHIATRIST claimed yesterday that the large, hairy spiders in a recent BBC Dr Who series were probably responsible for "an epidemic of spider phobia" among young children. Dr Michael Hession, consultant psychiatrist to the Church of England Children's Society, writes in the General Practitioner that fears and phobias are almost universal among young children. Phobias such as those of spiders may have cultural or family origins, he adds, but spider phobia is not one of the more severe or disabling, child fears. The BBC said the spiders used in the series "weren't like ordinary spiders." They added that it was the first time they had heard about the effects claimed by Dr Hesston. Mrs Mary Whitehouse, the secretary of the National Viewers' and Listeners' Association, said today: "This psychiatrist precisely underlines the warnings which we have been giving of the effect of Dr Who on the very small child. The BBC admit they have done no research into the effect of television programmes on children under five and that this programme is really meant for the intelligent child of 10 and over. Yet they persist in putting out Dr Who at 5 30 in the evening." APA 6th ed. : (1975-04-28). Doctor Who gives kids the creeps. The Guardian p. 7. MLA 7th ed. : "Doctor Who gives kids the creeps." The Guardian [add city] 1975-04-28, 7. Print. Turabian: "Doctor Who gives kids the creeps." The Guardian, 1975-04-28, section, 7 edition. This page was last modified on 20 November 2014, at 03:05.